You face a King who scrutinizes you before handing you the mysterious key. He warns you before you open the door that you must not lose this key. The door opens and you close your eyes, a smothering sensation and blinding moment clouds your mind. Some fall to their knees and when they arise know nothing more of the world they came from. On the key your name is engraved. That is all you remember before walking down a long path that looks more like a corridor. You enter a sterile looking space that will be filled in by your imagination only. On the other side of your key is engraved Kingdom of Planes. You may transport back and forth to the medieval Exodus Night, but will remember nothing from either plane when in the other. Kingdom of Planes will be transport you to a new kingdom which will be basically Science Fantasy based FFRP. You will keep the same levels and names there, but will pick Sci-fi based weapons from a list for your existing level. How this will work is; none of your Exodus Night items will be used. On the bottom of your char sheet I will put in the topic, Kingdom of Planes, and only those Items will be used in that world listed under that topic. This will be strictly FFRP, please be original since it is much more fun than Fan Fiction. There will be no can I have this or that requests in this game. As you level up you may choose from a suggested list of items, and you may FFRP elaborate about them... try not to be godly in your descriptions. The dice system will remain the same for rolls d100, but it will be a succeed, or not succeed roll. A campaign will work into this new world. When entering Kingdom of Planes your level- power will remain the same, but you will remember nothing of Exodus Night's medieval world or the people in it. These planes are 2 separate worlds even though you will travel through time. Another words, you won't know each other and will have a new chance of creating a unique storyline. 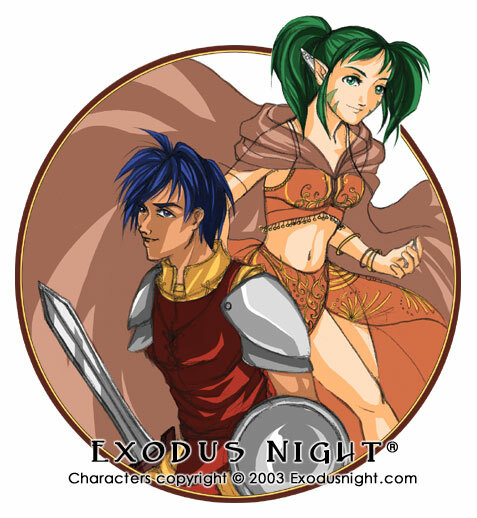 Exodus Night will remain the medieval genre, but some of you have expressed the desire to role-play out Science Fantasy. Please note I do not call it SC-Fi there is a difference. The room name is #Kingdom`of`Planes. This does not mean the medieval game Exodus Night is closing. This is just a transport in time to a new plane for players to enjoy. We will keep the medieval game active with ongoing story-lines and quests. We have also opened up a room #CulinaryGathering for people to chat about food, exchange recipes and play food trivia. Sarky Arts is dedicated to -all- arts. Enter irc.SarkyArts.com port 6667 to see our new rooms. Located on www.SarkyArts.com you will see our rules and how to connect.